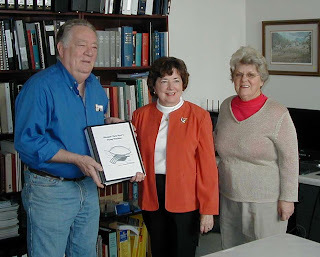 Pictured above: Historical Society President Sam Ensley accepts book from great, great grand-daughter Sylvia Dyer Turnage, as Board Member Betty Jane Shuler looks on. The Union County Historical Society has had on display for some time in the Old Courthouse Museum a copy of the 1874 patent granted to Union County’s pioneer aviator, Micajah Clark Dyer. There is also an artist’s sketch and a model of his plane, along with several pictures for visitors to see. But, if you have not heard the story of this man’s remarkable design, construction and flight of an airplane, which occurred more than a quarter of a century before the Wright brothers, you might not realize the significance of what he did without some further explanation. Sylvia Dyer Turnage, great, great granddaughter of Clark Dyer, has filled that void. She donated a book for placement in the museum that contains the story of the invention, along with dozens of pictures and illustrations of the man, the place and the times that will inform those who do not know about this historic event. It is an important piece of Union County history that was nearly lost before Clark Dyer’s 1874 patent was finally found about two years ago in the U.S. Patent & Trademark Office by his great-great-great-grandson, Joey Dyer. 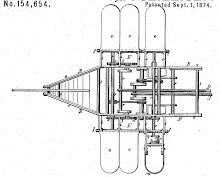 Up to that time, there was only family legend about the invention because the patent and the airplane were sold after his death to someone in Gainesville or Atlanta; and descendents were later unable to trace the sale. 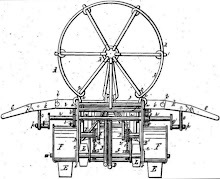 After discovering the patent in the Trademark Office, the family renewed their search for information, which resulted in their locating two 1875 newspaper articles that reported the invention. If you don’t know about this part of Union County’s history, come by the museum and learn the facts.